Why does Marvel outrank, outscore, and out film DC? Because Marvel knows how to plan things out years in advance to produce killer, interwoven plots. Guardians of the Galaxy seemed like a mediocre film from the trailers, but trust me when I say this movie can stand proud on its own in the Marvel Universe. If you’ve kept up with all the after-credit scenes from past Marvel movies, you’ll know that Guardians IS in the same universe as the Avengers. Soon they will have to come together to beat a threat certain enough to give both parties a fight. That threat is Thanos, the big boss man seen after the credits in The Avengers. He makes an appearance in Guardians and, if he gets his way, it could spell trouble for the entire Universe. Finally, we’ll get a greater glimpse at the connection between the Aether and the Tesseract and why Thanos is looking to collect them (and the rest of the Infinity Gems). 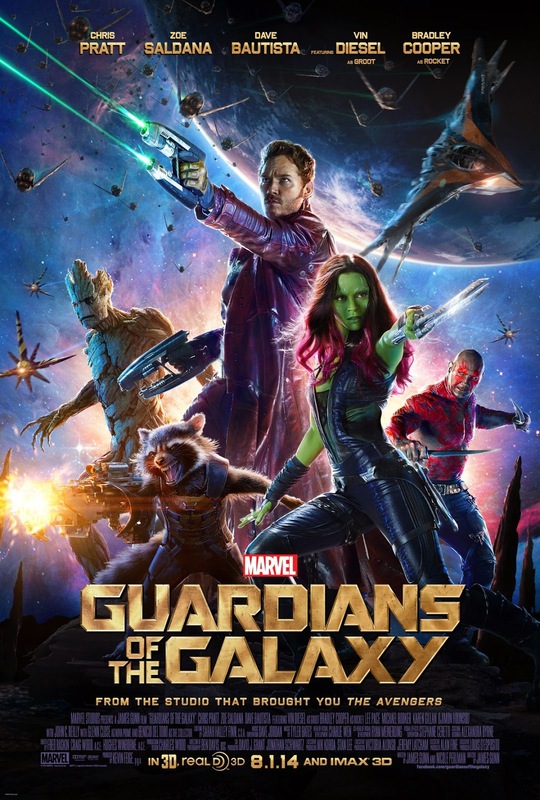 Guardians of the Galaxy follows Peter Quill (Chris Pratt), a human abducted from earth who’s a rogue and a lady’s man, Gamora (Zoe Saldana), an assassin with moves to rival Jackie Chan, Drax (Dave Bautista), a juggernaut alien out to do some avenging of his own, Rocket (Bradley Cooper), a loudmouthed lab experiment, says what's on his mind raccoon, and Groot (Vin Diesel), a tree-like, self-regenerating mini-Ent. Put them together and you’ve got the Guardians of the Galaxy, a ragtag team of misfits and anti-heroes struggling to get along long enough to save their galaxy. The threat? A renegade alien named Ronan (Lee Pace) who wants to reduce everything to ashes with a power we’re all too familiar with. Guardians of the Galaxy is full of action, extra doses of comedy, sarcasm and plenty of 70's and 80's references. The soundtrack was a home run! I’d recommend this movie to anyone, Marvel fan or not.